A planet close to Earth but far to visit. A planet which has intrinsic magnetic field. Though the size is between that of the Moon and Mars neither of them have intrinsic magnetic field. It is a planet that scientists would be thrilled to observe once in their lives. It is a planet which has scarcely been observed directly due to its extremely hot environment and enormous fuel requirements to inject an explorer into an orbit around it. This mysterious planet is called Mercury. The only Earth-like planets that have intrinsic magnetic fields and magnetospheres are the Earth and Mercury. We are anticipating that for the first time detailed explorations of Mercury will lead to a huge leap in knowledge about the "universality and uniqueness of magnetic fields and magnetosphere in universe." In addition, global observations of Mercury's peculiar interior and surface, including its huge core that is believed to relate to the existence of magnetic fields, will contribute to resolving the mysteries of the formation of the solar system, specifically "the origin and evolution of Earth-like planets." These results will affect the basis of solar-system science. The "BepiColombo" is the first full-scale collaborative project between Japan (JAXA) and Europe (ESA). This ambitious project aims to solve all the mysteries about Mercury by bringing the two orbiters (one made by ESA and another by JAXA) to Mercury at the same time. BepiColombo will make the first multilateral and general observations of magnetic fields, the magnetosphere, the interior, and the surface. During the six years of cooperation, JAXA, ESA and Japanese and European researchers become very close. The prototype design of satellite is nearly complete. Tests on the Structural and Thermal Model will start next fiscal year. We will confirm the survivabilty of the satellite under the extremely hot environment, where the sunlight is 11 times stronger than on Earth through the test. After that we will proceed to the design of the flight model, production and tests. So far, we have produced and verified the individual element models, but it is now time for us to start full-scale production of these satellites. BepiColombo will fly by the Moon, Earth, Venus and Mercury. Electric propulsion will be used during 6 years cruise phase. The mission is to perform 1 to 2 years of observations from a polar orbit around Mercury. 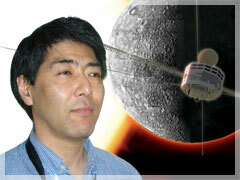 We are promoting this project with the dream of the day when we will receive observation data sent back from Mercury.